SunModo’s innovative TopTile™ Mount is the world’s first PV mounting system that is mounted entirely above the tiles. The mounting system spares an installer the need to deconstruct the tile roof, unseat the battens or leave unsealed fasteners in the underlayment. The system also allows installation on the ridges of curved tiles for superior water leak protection. The TopTile Mounts are easy to install which significantly reduces installation time. TopTile Mount is High-Velocity Hurricane Zone Approved. 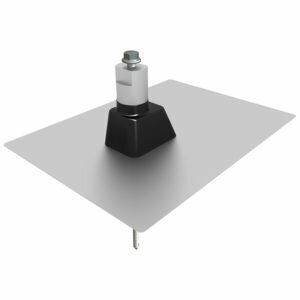 Mounting stanchion can be mounted on a tile ridge independent of rafter position. Hand bendable flashing and EPDM rubber boot for easy fit and superior leak protection. Works with 90% of the tile roof types. High-Velocity Hurricane Zone Approved – Passed TAS 100 (a) Wind-Driven Rain Test. Cut down installation time by 50%! We want to work with you! Call us or send us a message.